The surgery involves relocating or transplanting hairs from the back and sides of the head to a balding area. Over time these hairs will grow, recreating hair where it has previously been lost. The end result is a rejuvenated appearance and this is what The Treatment Rooms specialises in. 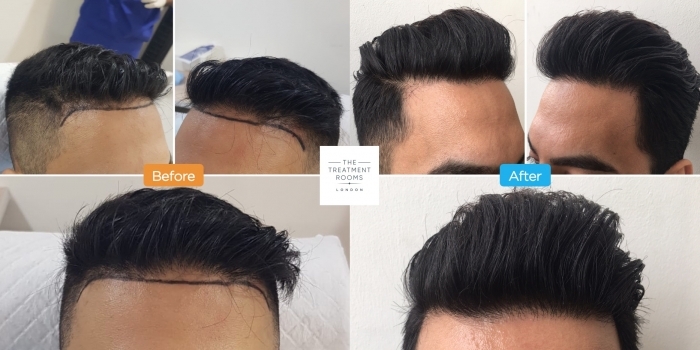 At The Treatment Rooms we specialise in providing FUE hair transplants for the frontal & temporal hairlines as well as the crown. New areas of growth and increasing density in the beard can be achieved using the FUE method. Our patients sometimes prefer their eyebrows to be reshaped. At The Treatment Rooms, we use finesse and attention to detail to fashion them perfectly. Hair transplantation is a treatment that is specific and personal for each individual. Every patient has their own expectations about what they would like to achieve by having this treatment. Providing personalised treatment plans is what The Treatment Rooms London specialises in. There are many different factors that will affect whether you are an ideal candidate for hair transplant surgery. This includes how much hair you have lost, your desired hair style, how much donor hair you have and your hair type. Dr Fernando is the Lead Hair Transplant Surgeon at The Treatment Rooms London. He is a member of the British Association of Hair Restoration Surgery upholding its stringent professional code of conduct when it comes to performing hair transplant surgery. His commitment to hair loss and its treatment extends beyond his practice at The Treatment Rooms London. He regularly contributes articles about hair loss and hair transplant surgery to the UK’s leading patient information websites. Dr Fernando is a board member of the London Aesthetics Show. This is the UK’s first patient awareness conference for those seeking aesthetic treatments. His role involves advising and driving the agenda of patient safety when it comes to hair transplant surgery. If you would like to find out more, click here to see our locations and contact us today to book your free consultation. Or simply start a WhatsApp conversation by clicking the Whatsapp Icon. How Does Hair Transplant Surgery Work? How Long Does Hair Transplant Surgery Take? For some cases our surgeons may recommend that the transplant is performed over 2 days/ sessions. These are particularly for cases that require large numbers of grafts that need to survive the transplant. This not only means you are more comfortable during the procedure but also gives you the best chance of a successful hair transplant. Hair transplant surgery is priced according the size of your transplant. This can only be calculated at your consultation where our surgeons will assess your hair loss and what can be achieved by having a hair transplant. For more information please click HERE. Even though you are fit to work the next day, for most patients we advise at least 4 days rest. This gives you time to recuperate and look after your newly implanted hairs! Most of our patients prefer to go back to work after 7 or 10 days. This allows for any signs of the hair transplant to disappear. If you wanted to find out more, read our dedicated pages on this topic- "Hair Transplant Aftercare and Recovery" or our blog "Hair Transplant Recovery: What You Need To Know". Hair loss affects 50% of men when they reach 50 years old. For most males the cause is male pattern baldness (androgenic alopecia or DHT driven hair loss). Depending on the extent of your balding you may benefit from a number of treatments. The assessments for these diagnoses will include a face to face consultation with blood tests if required. Treatment for female hair loss depends on the underlying cause. Assuming you suffer from female pattern hair loss, Minoxidil might be your first line of treatment. If you wanted to replenish hair in areas you have lost it then a female hair transplant might be a treatment option for you.